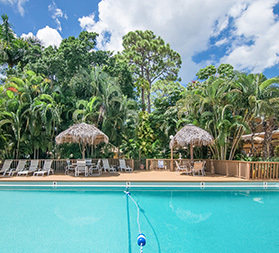 Sitting on one and a half acres of beautifully landscaped tropical gardens just minutes away from one of South Florida’s best preserved beaches, the Fairways Inn of Naples embodies the much sought-after charm of Old Florida style and congeniality. From standard Guest Rooms to full Kitchenettes, the Fairways Inn is the perfect place to call home, no matter how long your stay. 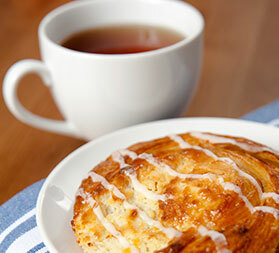 Enjoy a light complimentary continental breakfast to include coffee, tea, juice, milk, pastries and cereal. in the beautiful garden pavilion each morning, and fire up one of our gas grills located throughout the property for a private barbecue later for lunch or dinner. Our oversized outdoor swimming pool is heated during the winter months for your year-round enjoyment. 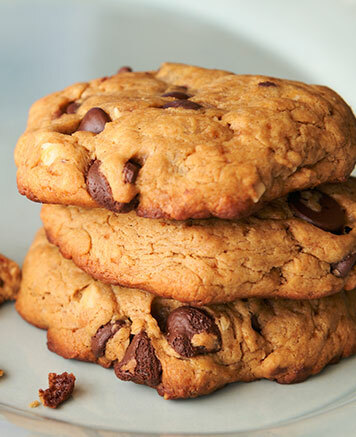 Each guest is welcomed to the Fairways Inn with cappuccino and fresh home-made chocolate chip cookies, made daily in the office. We also provide water in the rooms as a little surprise welcome gift. Each room includes a refrigerator, microwave, coffee maker, flatscreen TV and small dining area, as well as free Wi-Fi Internet access. The Fairways Inn offers several ADA-compliant suites for our disabled guests, and we are also happy to accommodate guests traveling with furry, four-legged companions. 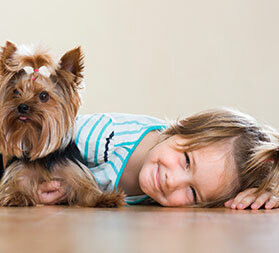 Please note that we charge a $50 non-refundable pet fee, with a 25 lb limit. 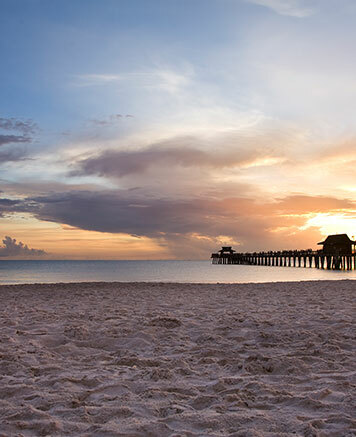 Ranked among the top hotels in Naples, Florida, our friendly front desk associates look forward to welcoming back regular guests and greeting new faces each year, and hope your stay at our beautiful Florida oasis inspires lifelong friendships with people from all over the world. For a true sense of what the Fairways Inn of Naples has to offer you, view our comfortable rooms and kitchenettes and our amenities in our photo gallery, and take a peek through our convenient list of Frequently Asked Questions. Be sure to book your room or suite online today and always feel free to call us in the office and speak to our friendly front desk associates who are always ready to assist you and help you find the best room for you! 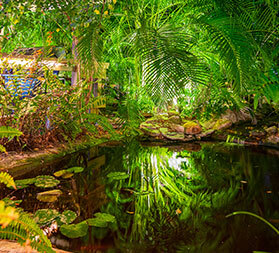 Wake up to a light continental breakfast served daily in the tropical garden pavilion. Beat the heat and soak up the sun in our oversized outdoor pool. 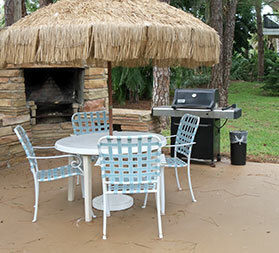 Fire up one of our many gas grills for a private onsite barbecue. Surf the Internet anytime, anywhere, with free Wi-Fi throughout our property. Explore one and a half acres of beautifully landscaped tropical gardens with all the charm of Old Florida. Fidos and Felines up to 25 pounds are welcome guests at the Fairways Inn of Naples.